A recent study, published in the April 2015 issue of the Journal of Marriage and Family, suggests that kids’ academic and emotional well-being is not necessarily contingent on the amount of time they spend with their mothers. The takeaway for some commentators: It’s time for busy moms to let go of the guilt they feel about not spending enough time with their kids. It turns out today’s working fathers are just as likely as working mothers to say that finding the right balance between their job and their family life is a challenge for them, Pew Research Center has found. Fully half of working dads say it’s difficult for them to balance these competing responsibilities; 56% of working moms say the same. 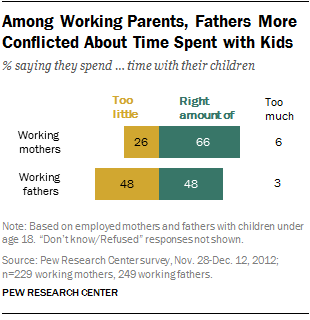 And about the same share of working dads (34%) and moms (40%) say they “always feel rushed” in their day-to-day lives. But when they’re asked about the time they spend with their children, dads are much more likely than moms to say it’s not enough. About half (48%) of working dads say they spend too little time with their kids, compared with just 26% of working moms. Most working moms (66%) say they spend the right amount of time with their kids. It’s true that today’s moms spend significantly more time, on average, taking care of their children than dads do. Analysis of recent time diary data shows that dads spent about seven hours a week on child care, compared with moms’ 14 hours. But those seven hours represent a significant increase from a generation ago. And nearly half of today’s working dads (46%) say that they spend more time with their kids than their parents spent with them. When it comes to parenting, dads are harder on themselves than moms are, especially dads who say they don’t spend enough time with their children. 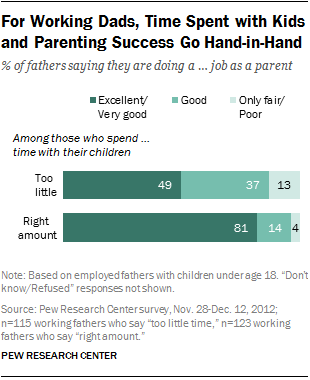 Among working dads who say they spend too little time with their kids, only 49% say they are doing an excellent or good job as a parent. In contrast, among dads who say they spend the right amount of time with their kids, 81% give themselves high marks for their parenting. The journal article found that – just as with mothers’ time – the amount of time dads spend with their children does not have a significant impact on the children’s well-being. But the researchers did find that time spent with both parents can make a difference in the behavior of teenagers.